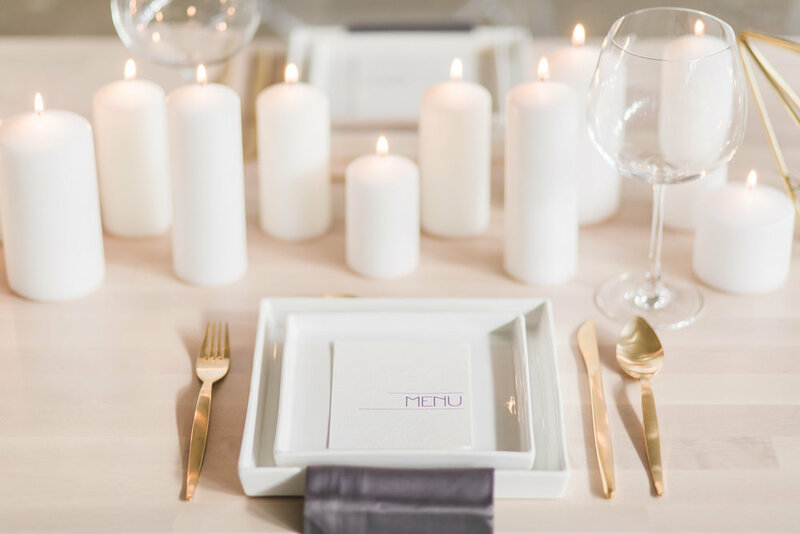 The term less is more was definitely prominent in this creative shoot styled by owner and lead wedding planner Jeannie from A Blush Moment. Simplistic was key when it came to executing a minimalist theme with clean lines, gold accents and an almost monochromatic colour palette. Tucked away in the heart of the distillery district Airship 37 was the perfect venue for this minimalistic shoot. An open space area made it possible to style the shoot from the ground up. Everything from the modern Ikea dining table to the ghost chairs from Chairman Mills to the hanging gold geometric prisms from A Blush Moment were carefully chosen for the shoot. Every item had its place. White pillar candles, which ran along the length of the dinning table, replaced the flower centerpieces commonly seen in weddings. The place setting was kept to a minimal with accents from the gold cutlery. The touch of gold was carried through in the hairpieces and earrings provided by The Loved One. The bride had her hair and makeup done by May from Muah Beauty before she slipped into two classic yet contemporary gowns provided by Elmwood Brides. The groom wore a custom grey suit from Wingmen Suits. A 5-tier cake created by the talented team at Sugar Tiers was the showstopper of the day. It definitely was too pretty to eat. This wedding shoot was captured beautifully by Anita from Rhythm Photography as well as Norris from Norris Films. Both photos and video showcased this timeless occasion for years to come. For my second creative shoot I wanted to choose a theme that was completely opposite from the first. I wanted a theme that had lots of character and unique details, with that being said, I decided my second theme to be a vintage tea party. The idea came to me while I was browsing Chapters one afternoon and came across The Vintage Tea Party book by Angel Adoree where she gives tips on hosting the perfect party. I thought to myself what a great theme it would be going back to old traditions, proper etiquette and vintage ways. Most of the vendors from this shoot were from my first one with the addition of Jamie from Dreamy Faces and Icon Models who provided me with two gorgeous models that were lovely to work with. (Not to mention, they made a perfect pretend couple) I really hope that you guys enjoy this shoot as much as the first one.